Margaret Thatcher’s Conservative Party came to power in 1979 at a time of great discontent, racial tensions and mass unemployment for the people of Britain. The music of Coventry’s The Specials tapped into a wider feeling of malaise amongst the youth in those early years of her destructive reign. 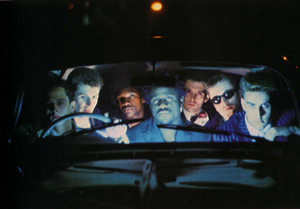 Released in 1981, it went to number 1 just as race riots exploded in Brixton, Moss Side and Toxteth, and the band’s politicised message of racial unity was at its’ most prescient.